Year 2006-2008 is about the oil price spike and the opportunity for being an expat is widely open! Is a career change worth enough? 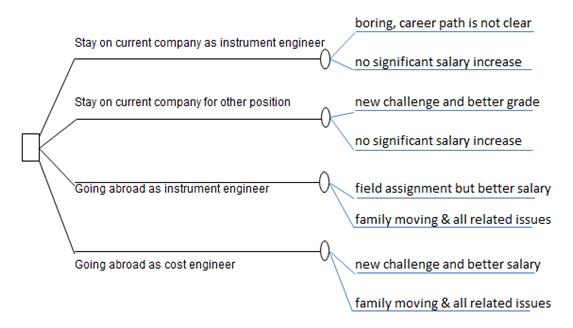 Some people say being an instrument / control / measurement engineer is better than a Cost Engineer? Being a cost engineer is boring, most of the time you have to sit in the office playing with a lot of numbers. The most difficult decisions I have to face generally involve tradeoffs. We often want to accomplish many different but conflicting objectives at once. As a result, I have to weigh the importance of the objectives and the extent to which each alternative helps to accomplish these goals. Most likely the decision will be Cost Engineer for going abroad but it’s not simple like that. The “Project Execution Plan” was developed to anticipate a “tradeoff” situation especially when dealing with family moving and all associated issues. Cost Engineer for going abroad, is this worth Doing? Estimated revenue generated as per agreement is KWD 24,000 per year (no tax, fair for the eastern people) excluding annual leave and bonus which is variable depending on achievement and oil price. Cons are mitigated under Risk Register. 1 KWD is equal to Rp 30,000 as planned but the average during year 2006-2008 was Rp 35,000 and the peak at Rp 45,000 in Oct 2008. 3 times bonus against the oil price US$ 147 / barrel in year 2007 and continue high up to Oct 2008. Transform knowledge from Instr. Engineer to Cost Engineer. Adapted to Arabic working culture. Resume is highly demanded in Middle East. Reducing manpower when the oil price goes down at the end of year 2008. Family doesn’t like living in Middle East. Sometimes playing with numbers are boring and found the instrumentation & control is interesting. Stay focus on Cost Engineering and find PDG in AACE class! This entry was posted in Candra Nugraha, Group Member, Week #3, Weekly Submission. Bookmark the permalink. Awesome, Pak Candra!!!! I loved it!! Really nice use of a variety of different tools and I would urge you to revisit this topic later on, after you’ve finished Chapter 14. Applying multi-attribute decision making to this kind of problem is really perfect, because not all the elements needed to make this decision are financial. There are “intangibles” to consider. Anyway, you followed the 7 step process in an appropriate manner and as noted above, you really used a nice mix of tools/techniques to support your decision. Anyway, best of luck to you and keep up the excellent work on your blog postings. Looking forward to getting a rough draft of your paper shortly as well…. Pak Paul, Thanks for the comments. I’m preparing the DA tools to face current condition due to oil price remain high for unknown time duration. Highly demanding skilled people in Middle East and North Africa as well as other region around the world. Again, the bottom line is WIIFM.